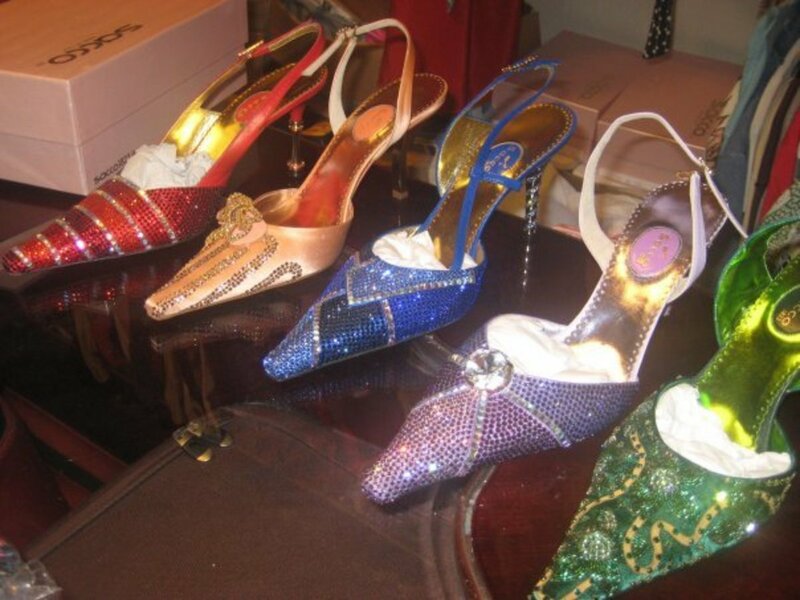 Did you ever want to whip up matching shoes and a bag? 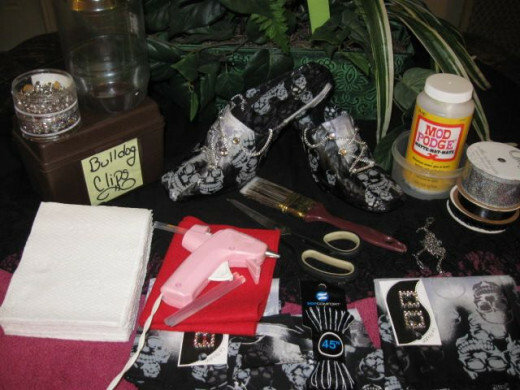 Come along on the following demonstration to see how I made a matching bag to go with some scary shoes. For just a buck each, a bandanna sure does go a long way towards enhancing my scary fashion accessories. 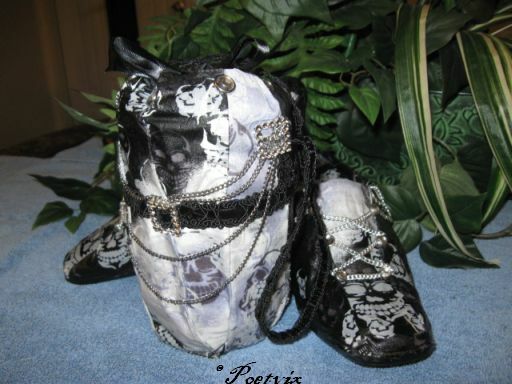 Recently, I upcycled an old pair of mules into some scary skull shoes with chains. Well, I kind of like them and thought it would be too cool to have a bag that matched. Since I have set myself the challenge of finding a way to reuse things that should not end up never degrading in a landfill, this little bag worked well. It began life as a Jiffy Peanut Butter jar. With a little scary boo bandana, some ribbon, chain and glue, my trashy jar just became scary chic with pleats. Let's scope it out. 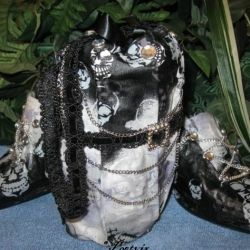 This upcycled scary accessory comes complete with drawstring closure and wrist strap, - not to mention skulls and chains. 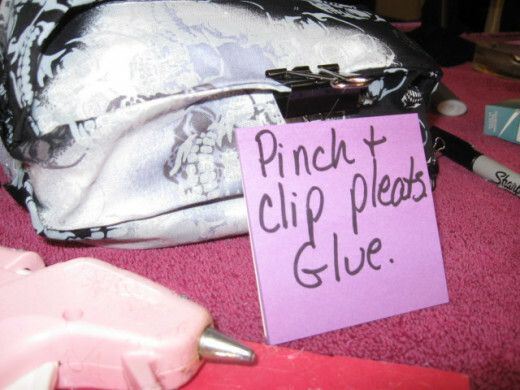 The purse is a very simple project that anyone can do. This was so easy to do. All told it took about forty to forty five minutes to complete minus dry time. Half of that was spent fending off the cat :). She's into crafts in a major way too. I could see teens and tweens going gaga for this project. Most of us go through a plastic jar or two and bandannas are cool and easy to come by. You really don't need much else, some ribbon, chain, buttons and glue will do it. The resulting purse is small, so it's a good fit for teens and young adults or someone on the go and not looking to lug a lot around. It easily holds my keys, phone, card wallet, lip gloss and a brush, all the essentials. For detailed, step by step instructions, just check out the pictures. The pictures in the gallery below walk you through each step from start to finish. 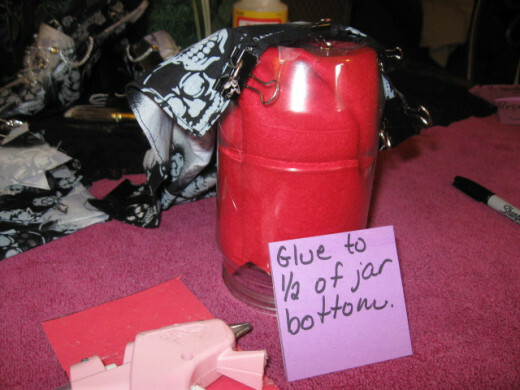 Watch a trashy jar becoming a jamming bag with a little help from a bandana. 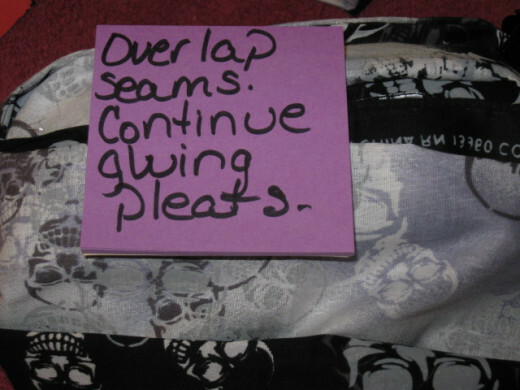 Bandannas are so convenient for crafting projects, especially if you're like me and don't sew. These make things just too simple. 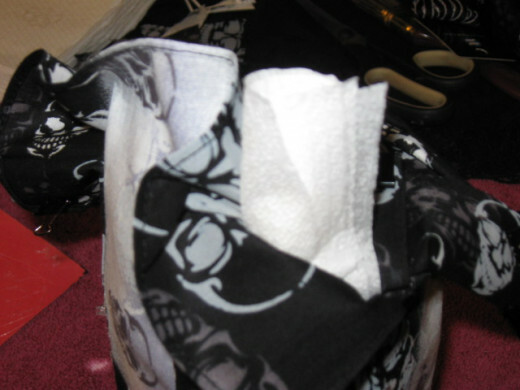 They always match, which can be hard to do with fabric that you have to cut yourself if using a pattern. They have perfect finished seams and line up easily. What's not to love? 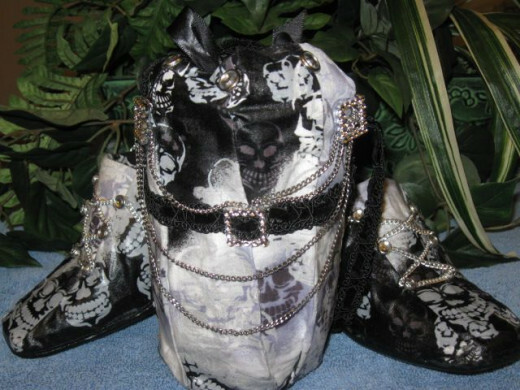 This one would be so perfect for a scary skull purse. 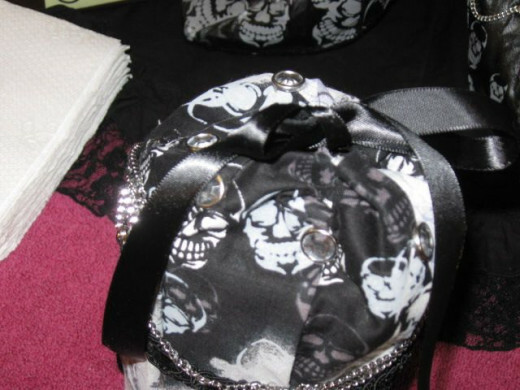 Such themes are great for the goth look, Halloween or just a super cool and edgy fashion statement. I really like how the smaller skulls and cross bones are on the outer edges. 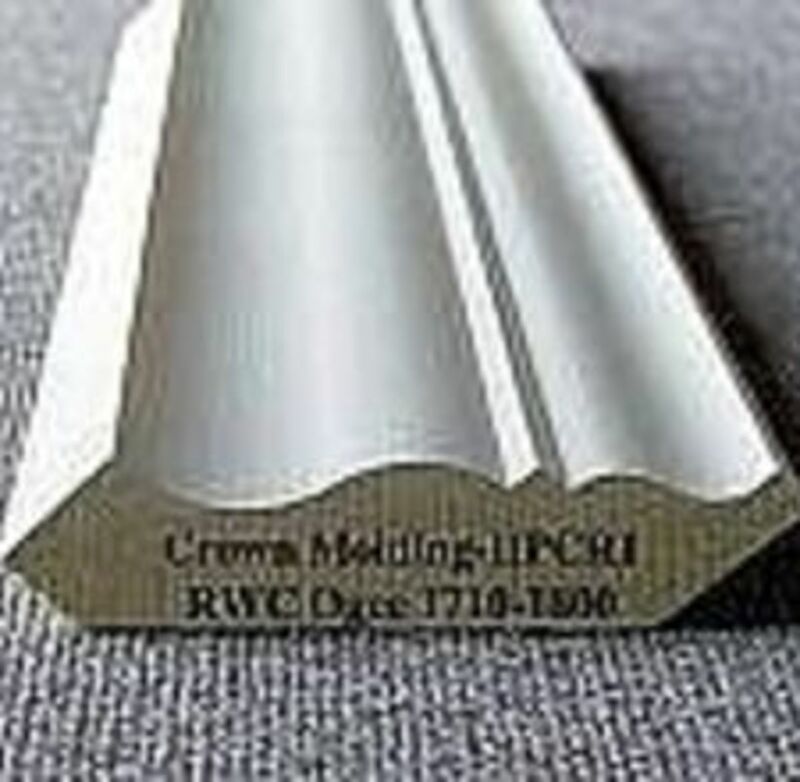 If using this for a project such as the one here, consider cutting them out and coating with Stiffy. They would make awesome buttons and/or embellishments that match. 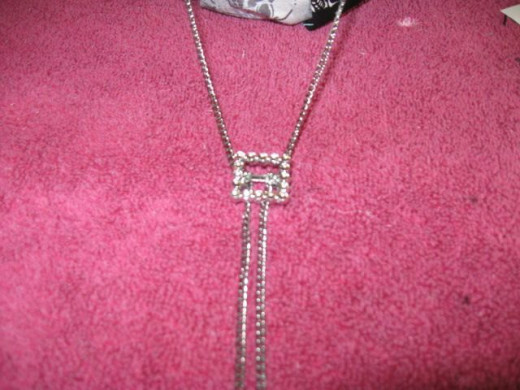 Using matching ribbon to create the strap and embellishments gives a more cohesive look to the finished product. 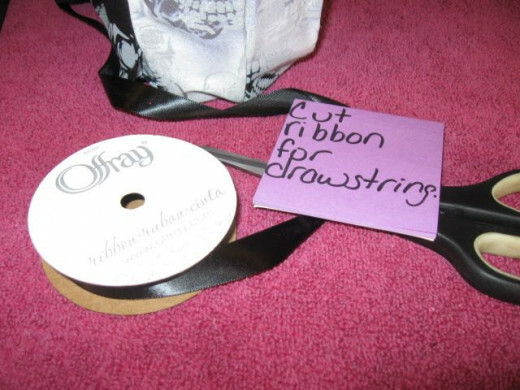 Use the same ribbon as used for the band around the purse. 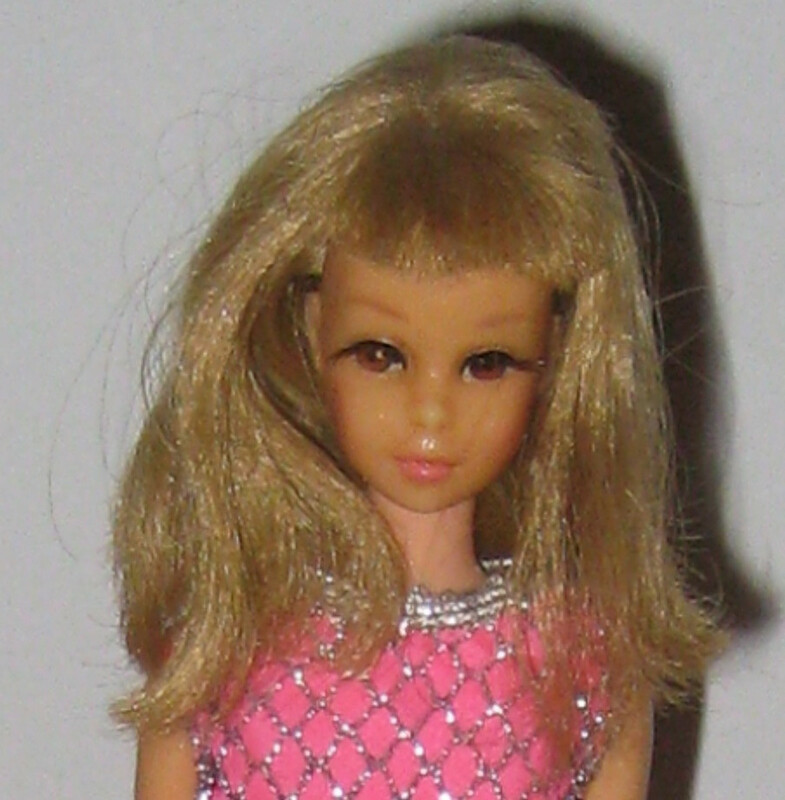 This one is short, wrist length, but you could cut it to any size you desire. 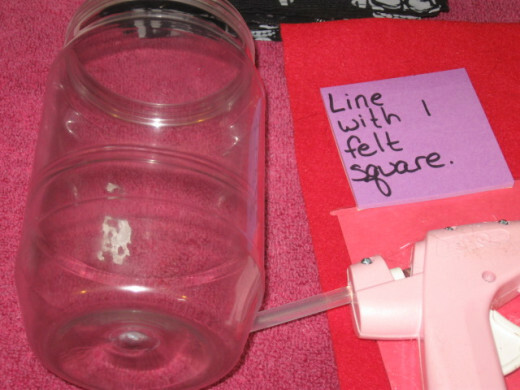 It's glued under the corresponding band and directly behind the buttons on each side. 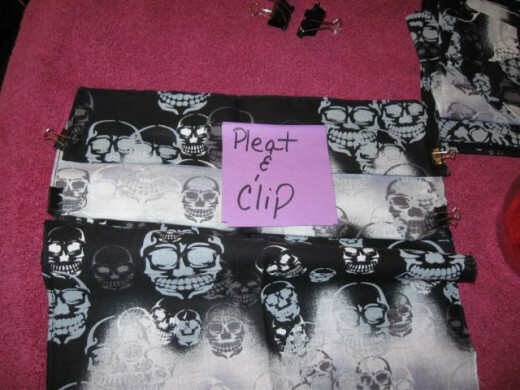 Two coats of Mod Podge later and scope it out, matching bag for the skull shoes. Sweet. Jump on the bandanna bandwagon. 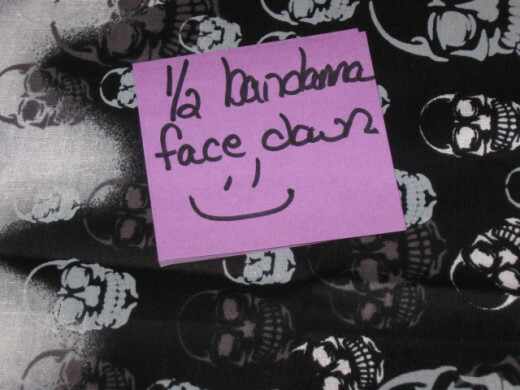 Bandannas are a fun, inexpensive, often free source of crafty goodness. 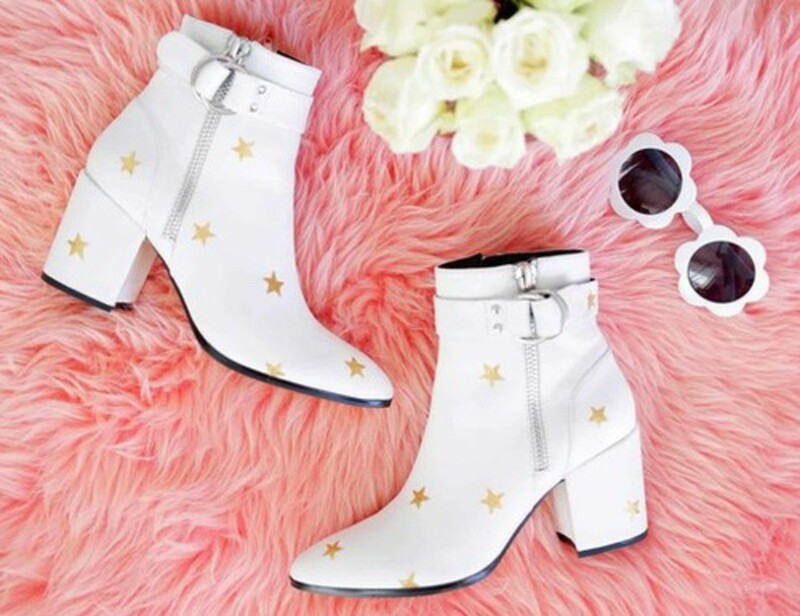 From bringing fashion faded back from the edge for some tired shoes, to upcycling binders and notebooks, to skirts, halters, belts and purses, bandannas are sure fire bet for ease of success. 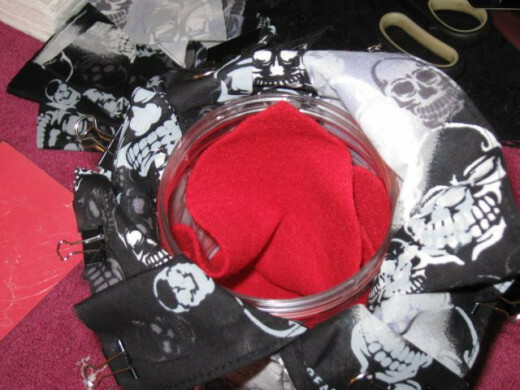 Bounce on over to the bandanna crafting bandwagon and bang out some fun of your own. 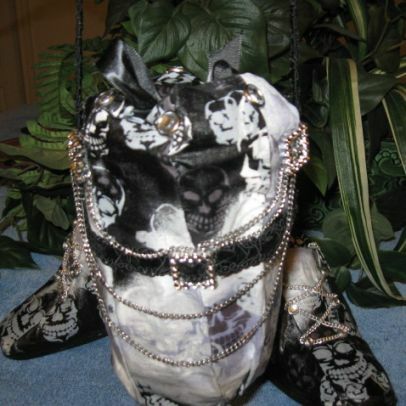 Here is another purse made from a bandanna. I love her style. It's easy to follow and very fashionable. 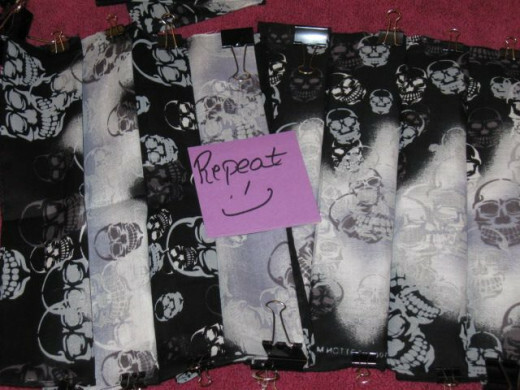 For larger group projects and classrooms, get your bandannas in bulk. It saves a bunch on the budget. How to make a bag out of bandanas by One World. To me, it's the cheat that just can't be beat. I found working with large groups of functionally disabled individuals that it was the little things that always sabotaged the projects. Things like frayed edges, holidays in the paint and so forth often made many no longer want to participate in craft projects. Who could blame them? Not me. When the effort is put forth, the projects should look decent. For that reason, bandannas are one of my top craft supply picks. The seams are already there. The nifty little fabric square gives one an edge up over plain fabric that needs to constantly be folded over, sewn or some other step that can be difficult for some. Plus, and this is a big one, how often does one find really cool looking fabric or packs of cuts? Seriously, you can find flowers, swirls, checks and plaids for days which is great, but skulls, dragons, monsters, skateboarders and rockers aren't easy to find in traditional fabric. They abound in the world of bandannas! Have some fun. Grab a bandanna today and get on with the crafty type play. It will make you smile. Please, let me know you dropped in by leaving your mark in the quest register. @Heidi Vincent: Thank you so much. I'm weird. I really will try to use anything. 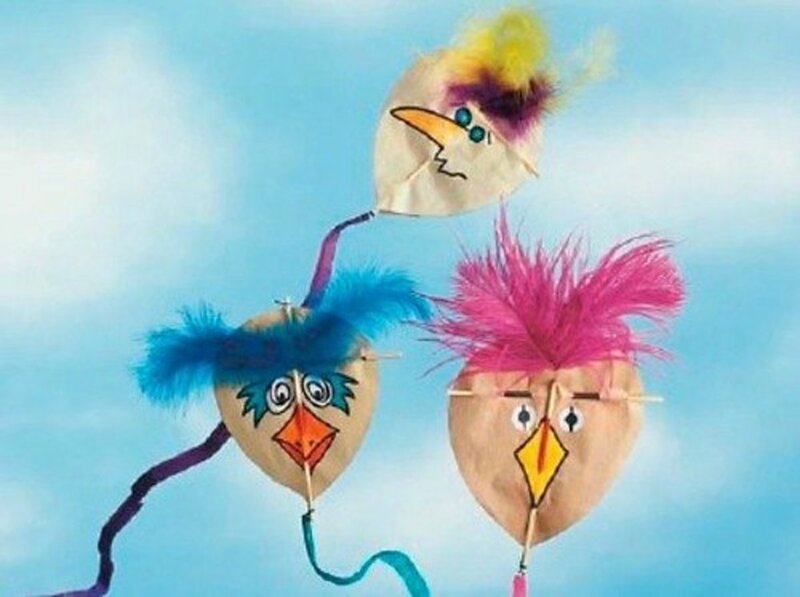 It breaks my heart how many kids don't get to do crafting at home because their parents honestly can't afford the supplies. When teaching, I saw so many kids that did good just to get three meals a day. I guess I'm on a mini mission to find projects kids can do with found objects and things most already have. God bless you! 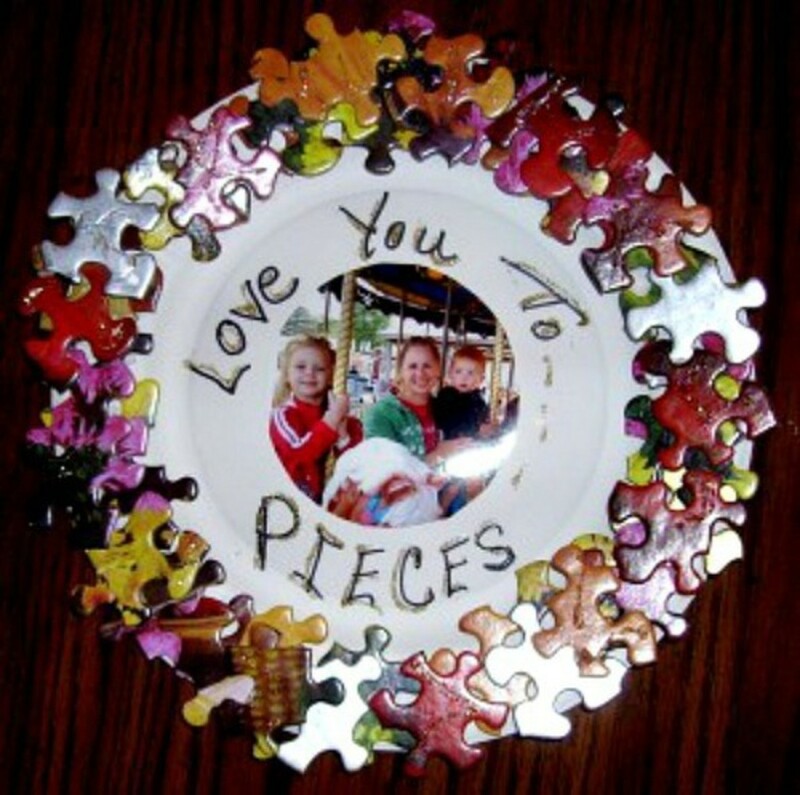 Another interesting craft project with an interesting material - peanut butter jar? I throw away lots of those and never thought of such a great project. Nicely done poetvix!